A giant mirror ball, reflecting the striped carpet below. What's not to like. We're flying through the air on a swing, wondering how high we can go and if we can ever generate enough energy to go all the way round. 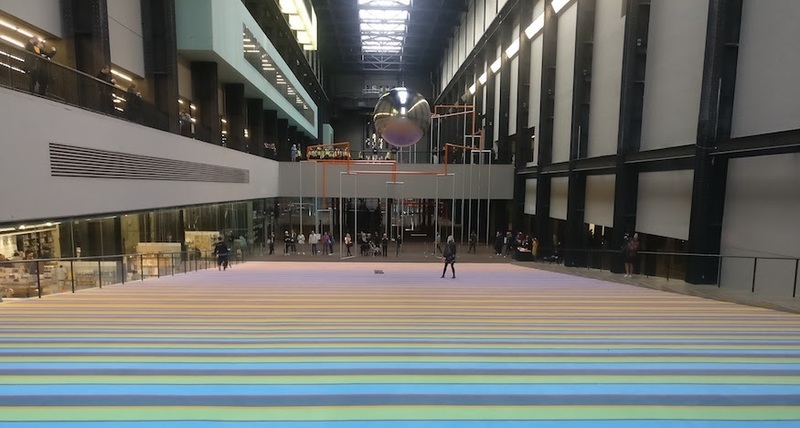 This isn't a nostalgic flashback to our childhood, but the latest turbine hall installation at the Tate Modern. This is a colourful and playful installation by Danish collective Superflex who have filled the Tate's hall with 22 swings and giant pendulum, and they definitely want you to have a play on the swings. Alas climbing on the giant wrecking ball/pendulum and having a Miley Cyrus moment isn't permitted. We've not had this much fun at a museum. We enter the Tate to see a giant metallic ball swinging above our heads, reflecting the trippy striped carpet below it and it's clear we're in for a treat. 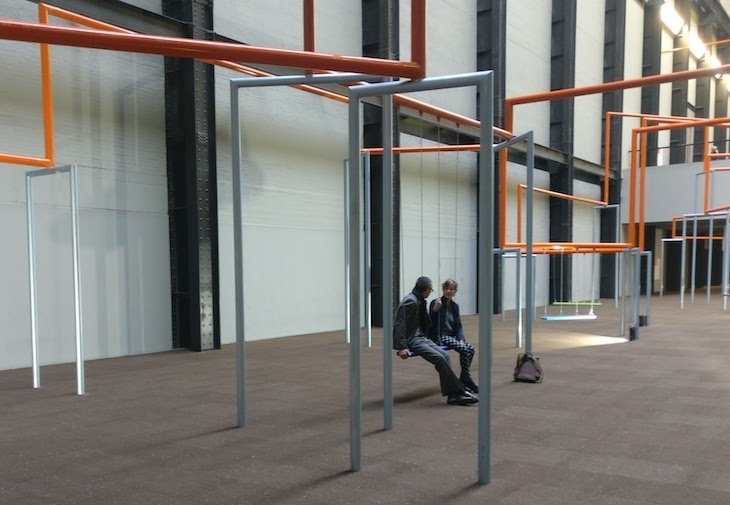 The swings are where the action is and they're all connected by an orange metal line — it's a call by the artists to all swing together to combat social apathy. This may sound like a bonkers idea but with the state of the world as it is, a bit of surreal humour is needed. 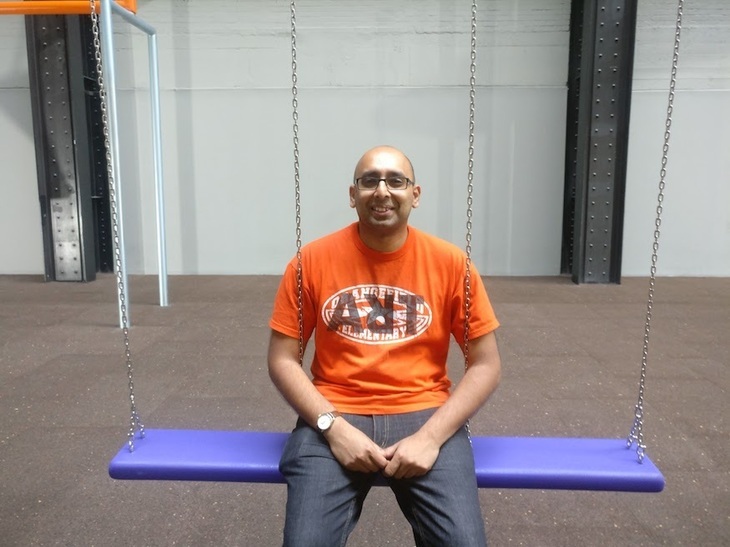 The orange line extends outside the gallery and more swings will be added to it over time. 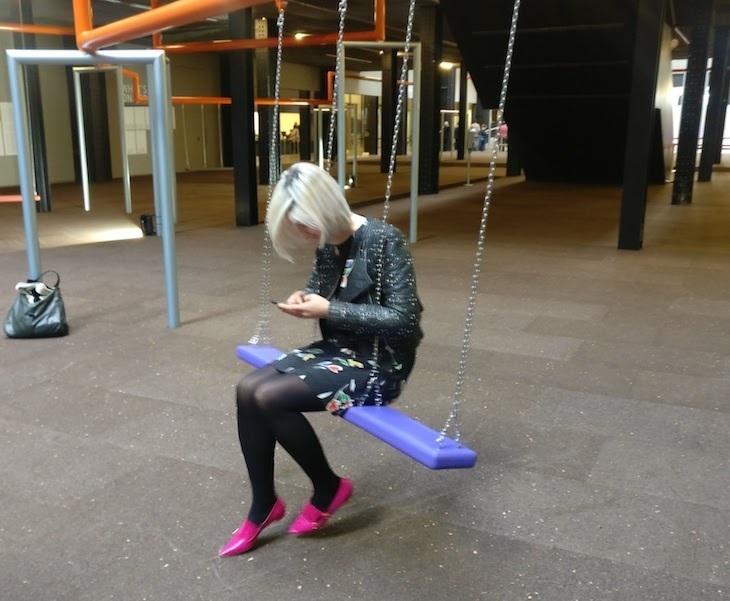 All meetings should be held on swings. Each swing has its own plaque declaring that our collective movement will change the trajectory of the earth, and this overblown claim adds to the fun. We spoke to a member of the collective — naturally while we were both on a swing — and they were unsure as to how it will be received. We're confident that people will love it and can picture the queues already. Even something as mundane as checking your phone is infinitely better when on a swing. It's at this point that we realised all conversations and business meetings should be held on swings. There's something very intimate and memorable about being in your own two-person bubble while having a swing convo. Regular Londonist readers will know that we're always harping on about how art should be made more accessible and how art can and should be fun. This ticks all our boxes and though it may not change the trajectory of the planet, it definitely will be enjoyed by everyone who visits. Swing away people, you'll love it. Hyundai commission — Superflex: One, two, three swing! is on at Tate Modern from 3 October until 2 April. Entrance is free.